Hamad bin Khalifa University (HBKU), a member of Qatar Foundation for Education, Science and Community Development, recently launched its Juris Doctor (JD) postgraduate degree program, which will be the university’s inaugural graduate law program and the first academic program of its law school. 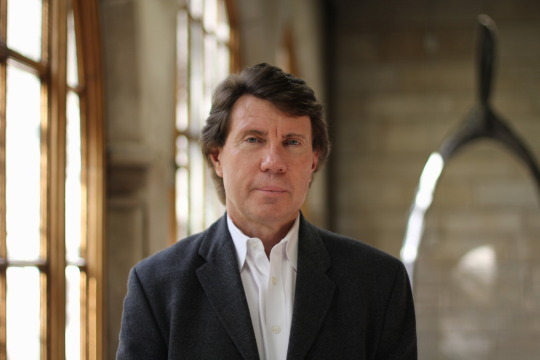 “HBKU’s JD, although built on the United States model, will be especially designed to address the multiple legal systems that converge in the MENA region,” says Professor Clinton W. Francis, the Founding Dean of HBKU Law School, who will also lead in the building the JD curriculum in coordination with the faculty and under the direction of Dr. Ahmad M. Hasnah, Executive Vice President and Provost. The new program will focus on the legal skills and knowledge needed to facilitate the region’s major economic and social development sectors– namely energy, infrastructure development, finance and global investment, healthcare and cultural endowment, and media. The JD program is a three-year, full-time graduate degree program, and is the first degree of its kind to be offered in the MENA region. In addition, the JD program targets graduates novative program focuses on the foundational principles needed to successfully practice law in region’s multiple convergent legal systems. “Successful participants of the program will graduate with a JD that is comparable with the best of those offered internationally, and will be equipped with a qualification that will enable them to make the most of a wide range of career options in the public sector, multinational institutions, or in academia,” says Francis. According to Francis, the JD program draws upon HBKU’s innovative approach to education through strategic partnerships, in this instance by developing and delivering the program in a strategic partnership with Chicago’s Northwestern University Law School. The curriculum is designed to meet the needs of individuals looking to enhance Hamad bin Khalifa University (HBKU) in Qatar their legal knowledge, those who deal with legal issues in a variety of sectors as part of their profes- sional careers, and students who are striving to become future regional thought leaders. “Participants in the JD program will receive an education designed to meet the needs of government organizations and businesses in Qatar and across the region, in line with Qatar National Vision 2030. The program will be delivered by expert faculty and staff with experience from all major international legal systems.” Among the reasons why this is the first JD degree in the region and is of high relevance is due to how it is designed to deliver the specialized legal knowledge integral to the needs of Qatar, the region, and the global community– without the need for additional domestic or foreign legal degrees. 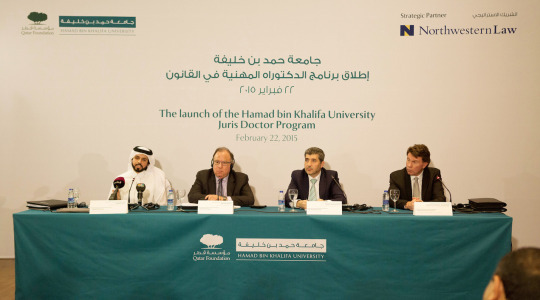 Image credit: HBKU Khalid Mubarak Al Kuwari, Deputy Counsel, Qatar Foundation, Daniel B. Rodriguez, Dean of Northwestern School of Law, Dr. Ahmad M. Hasnah, Executive Vice President and Provost of HBKU, and Professor Clinton W. Francis, Founding Dean of HBKU Law School at the press conference announcing the new Juris Doctor program. Francis notes that while the program is designed for graduate students with a strong undergraduate background in any discipline like similar programs in the U.S., “key differences are that while maintaining the academic rigor of its U.S. counterpart, HBKU’s JD also is a transnational program that addresses the multiple legal systems that converge in Qatar and the region. [The program] emphasizes the legal skills needed to facilitate Qatar and the region’s major economic and social sectors such as energy, infrastructure development, finance and global investment, healthcare and cultural endowment and media.” The JD also differs from a LLM (Masters of Law) degree offered in the U.S., U.K., Europe, Qatar and elsewhere since the JD does not require pupils to hold an existing degree in law. Duration also differs as most foreign LLMs are one-year in length. “The in-depth legal training gained from a JD program will provide students with international credentials that open up the opportunity for professional practice and leadership in Qatar and the region.” Additionally, the LLB is a program for undergraduates, and the JD is a graduate level law program recognized internationally as a more advanced form of legal training. “The HBKU Law School JD further distinguishes itself from typical LLB programs by providing a high level of context-based, experiential legal learning. Those already possessing an undergraduate law degree can participate in the JD program to specialize their legal knowledge and broaden their skillsets,” explains Francis. Generally speaking, the skills learned throughout the three-year JD program are highly transferable and would expose individuals to opportunities in a variety of other fields, including the five economic and social sectors focused on in its curriculum: energy, infrastructure development, finance and global investment, healthcare, and cultural endowment and media. The curriculum will cover three areas of legal education in-depth including conceptual theory, the function of law, and the application of law. The first half of the program focuses on core legal principals using case studies drawn from these sectors: “students will be introduced to the context of legal governance, as well as fundamental legal principles and skills, over nine courses. The second half of the program focuses on each field of study in-depth, with teaching focused on legal milestones associated with the respective sectors.” In addition, innovative teaching methods will be used wherever possible and will include simulation role-playing, commercialization, and clinical-practice modes. Consequently, though the JD program is often recognized as primarily for the U.S. market, the JD is also offered in Australia, China, Japan, the Philippines and Singapore. “We are currently working closely with the Ministry of Justice, Attorney General’s Office, industry, and other key stakeholders to ensure recognition of the degree here in Qatar,” says Francis in reference to the JD being valid for those aiming to practice or accredited abroad. Once the program starts in the fall of 2015, the students will be taught by a combination of faculty based in Doha and visiting faculty from around the world, including Northwestern University School of Law based in Chicago. Additionally, in the near future HBKU plans to establish cooperative relationships with select internationally renowned universities and corporations, as well as ministries and branches of the judiciary.